When an artwork features both high-intensity lasers and a carbon fiber sculpture to keep spectators back, you know it's not going to be dull. 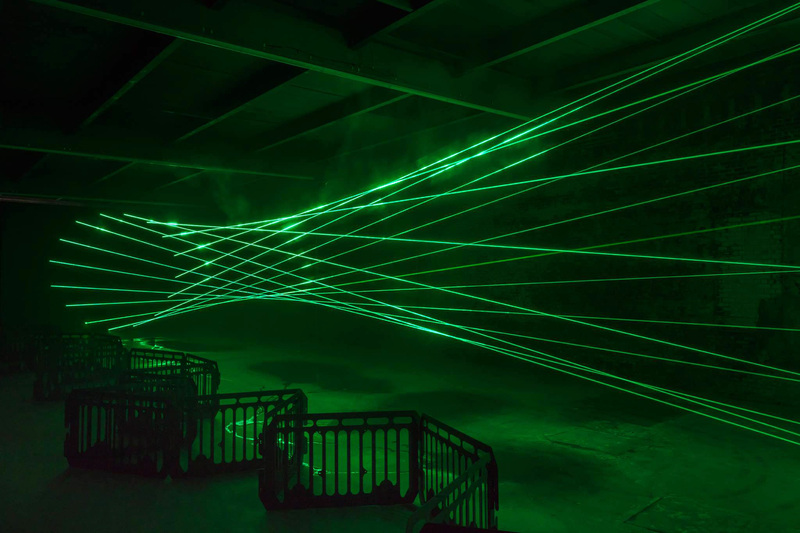 Rita McBride's Particulates art installation at the Dia Art Foundation in Chelsea, New York features 16 lasers, scattered by particles of dust and water, forming a visual depiction of a science fiction "wormhole." The barrier, meanwhile, is meant to keep you away from said lasers, which are strong enough to do some harm. The low-key exhibition is located at Dia:Chelsea, a former factory where marble was cut (by saws, not lasers). As spotted by Design Milk, there's a sign outside the entrance door warning of laser radiation of 1.2 watts per beam, easily enough to damage your vision or burn you. McBride drew inspiration from another exhibition at Dia:Chelsea by Dan Flavin, a minimalist piece called untitled, to you Heiner. That features a low, metal barrier 110 feet long adorned with green fluorescent lights that transform the drab cement space into something otherworldly. Much like Flavin, McBride's piece was conceived specifically for the Dia space and uses green light, in this case from lasers. However, it varies in that the light itself forms the "sculpture," and is separated and delineated by the carbon-fiber fence structure for both artistic and safety reasons. Unlike most sculptures, it's unaffected by gravity, and with the powerful lasers, would be an infinitely large piece unbounded by space if not for the back wall. Though you can call the piece minimalist art, it's based on McBride's interests in space, time travel and quantum physics. "I've always loved the efficiency of wormholes and the possibility of time travel," McBride said last year. "And also this highly hypothetical, theoretical position that seems to give a lot of possibilities." It also just looks cool from various angles, as the beams criss-cross and vary in intensity, depending on where you stand and how much dust and mist is floating around at any given moment (see the video, above). As such, you can enjoy it as a contemplation of physics, art or geometry, making the whole thing more fun as a spectator. Particulates is now exhibiting at the Dia:Chelsea in New York until June 2, 2018. If you can't make it in person, there's a livestream every few days shot from a camera that's located at the one place you don't want to be as a spectator: Inside the circle of lasers.